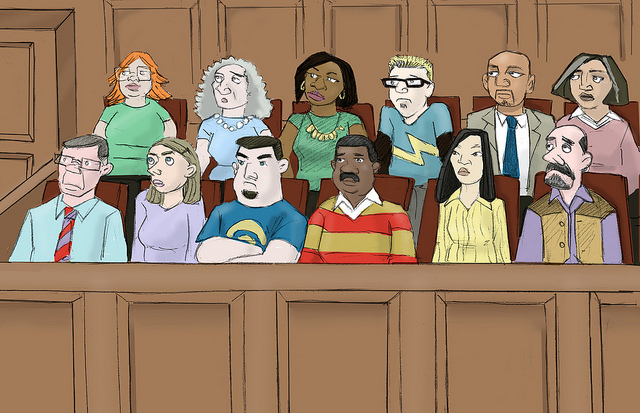 Should an atheist suit on a jury? The question seems bigoted; why should anyone want to exclude atheists simply because of their denial of the belief in God? I wouldn't disqualify someone simply because he or she identified as an atheist. Atheists as much as anyone else should be able to do the things jurors are called upon to do: weigh testimony, weigh evidence, and deliberate with other jurors to seek a just and impartial decision for the case at hand. In order to do those things a juror must be have some kind of criteria for what counts as evidence and what doesn't. But upon what standards do they rely in order to accomplish this? 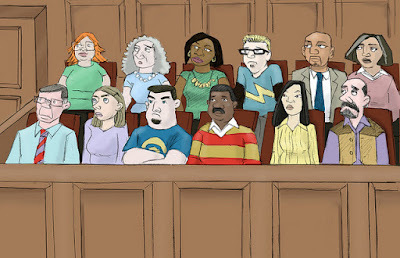 What is the juror's understanding of evidence and is it important? Of course it is, which is why our legal system has a practice of voir dire in selecting the jury. Voir dire is a French term for the preliminary portion of the trial when potential jurors are called to the courtroom and the attorneys for both sides ask them questions to see whether they may be biased or somehow otherwise disqualified from serving on that particular case. If a potential juror would say something like "I won't accept a verdict of guilty through eyewitness testimony; I must have physical evidence or see the crime committed myself!" you can expect that person to be eliminated from the jury. I bring this up because I recently had a conversation with an atheist that led me to question his understanding of what is reasonable evidence for belief in anything. He claimed that while he was an atheist, "I can think of lots of things that would make me believe - nothing too difficult would be needed." When asked for an example, he replied that saying "hello" would do and a chat with him and his wife would be better. I then asked if God appearing only to his wife and having her relay the appearance to him would be sufficient. "No I don't think that would do. I'd want more than second-hand evidence." I pressed and asked what if his wife's claim was corroborated by multiple others. He replied, "I can't really tell, but I doubt if the claims of the other people would really make any difference. Lots of people think they know when someone is lying. But they can't. It's why evidence is essential." He defined his term , too. "I meant corroborating evidence. E.g. photos, DNA, records." This is where I would ask the gentleman to be excused from the jury. There is nothing appropriate about holding to criteria where knowledge on big questions can only be gained from direct, first-hand experience. The criterion isn't even consistent within itself. First, how do you know the evidence wasn't faked? Must one follow the chain of custody personally to prove it was gathered, stored, and analyzed without tampering or is he going to accept the testimony of the witness presenting the evidence that this is so? Even if one grants the evidence is factual, how do we know that it actually points towards the defendant? Is my atheist friend an expert in DNA and genetics or is he taking the word of someone else? Why does he know that DNA analysis cannot provide a false positive? How does he even know which genetic markers were tested and how unique they are? All of this is trusting in the testimony of another person! Another issue arises once the trial is concluded and the jury is sent to deliberate the case. Now, you have to listen to the opinions and thoughts of eleven other jurors who are also weighing the evidence and the testimony. Will he discount their views on what makes up convincing evidence if they believe in God? Is that appropriate to do? The skeptical stance of rejecting testimony because "people can lie" is unreasonable. Worse is characterizing those who believe in God as "believ[ing]in magic," and dismissing their testimony or opinion in the jury room. This is in no way a reasonable foundation upon which to weigh truth claims. Now I want to be fair and note that he did later qualify his answer. He said, ""[It] depends on the claim being made. If someone says they had toast for breakfast I believe them." That's fine. By what criteria does one judge where testimony is no longer sufficient? Unfortunately, we had to end our conversations before I could ask that question. But the problem doesn't go away. My guess, given the "belief in magic" comment, is only discussions about the supernatural rise to that level of incredulity. But such a distinction is arbitrary; there's no reason to exclude the supernatural from being evidenced by testimony. It simply shows bias on the part of the atheist, and as a biased party he cannot be relied upon to provide an unbiased verdict on the question of God. The juror is excused. Photo courtesy CALI - Center for Computer-Assisted Legal Instruction and licensed via the Creative Commons Attribution-NonCommercial-ShareAlike 2.0 Generic (CC BY-NC-SA 2.0) License. 1) I agree that it's impractical and unnecessary to hold to a "first hand experience" type of requirement for evidence in most things. But testimony is insufficient for many reasons especially when it comes to the supernatural. There are too many problems with memory and communication and deceit (self or otherwise) to put any substantial weight on it. 2) You're over-generalizing when you say an atheist cannot be unbiased with respect to a verdict on the God question. I could easily say the same thing about a theist for various reasons. Who is unbiased in this respect? Your claim that atheists are biased is just because you think testimony should be sufficient. (Is that right?) To which I refer you back to the paragraph above and ask, do you have other evidence? If so, why worry about testimony? Thanks for your comments. I appreciate them. Please note that my argument isn't that testimony is sufficient. All testimony needs to be weighed against other testimony, any facts we do know. and so on. The only bias I'm claiming (and I'm not even claiming it for all atheists) is to rule out any testimony a priori as evidence for the existence of God. That's a big difference. Understood. Please realize that I started as a Christian and am an atheist now in part because I looked at testimony (basically, the Bible) and stood back from my belief to evaluate it and give it the weight it truly deserved. Obviously, I decided it didn't deserve much weight. To give one reason why, consider this. Unlike "expert witnesses" in trials whose credentials can generally be verified, those writing the Gospels have no documents, experience, other publications to back them up. I could give other reasons, but my point is this: even though I might brush off your claim of testimony now, it's only because I did just what you said. I evaluated it against other testimony and other information that we have. I went through the process you describe without this bias that you discuss. If there was any bias in me before, it was FOR the testimony. I suppose you might say it's a bias now AGAINST testimony but it's only because I did the work to evaluate it. So, perhaps I'm just one of those atheists whom you do not accuse of this bias. Which brings up this point: Why even bother with this article? You are attacking a meaningless stronghold. If you are right (which I agree you are to some degree), you have done little if anything to advance your cause. There are still many people like me who have specific, considered reasons for rejecting the testimony. I actually have been contemplating the opposite; that is, only athiests should be allowed to sit on juries. The argument is this: anyone who holds an active, affirmative belief in god is irrational and incapable of evaluating evidence or putting aside personal bias to arrive at conclusions based on facts and reason. The only acceptable jurors are either those who declare themselves athiests or agnostic or have no belief whatsoever. Yes, let's take a single conversation with a single atheist as representative of all atheists. That's not bigoted at all.